Shredding your sensitive files is necessary. Choosing the right service can save you big money. But how do you choose? This article compares drop off shredding services and mobile document shredding services to help you understand which service best meets your needs. We include information regarding the volume of documents you have, what your security requirements are, and how much you are willing to pay. Whatch the video or read the transcript below to learn more. There are several different ways to shred, and finding the most cost-efficient option depends on your individual project needs and goals. For example, if you’re someone who constantly has documents to shred, saving up paper for a mobile shredding solution can be a good option for you to not only save money, but also to save the time shredding can take. 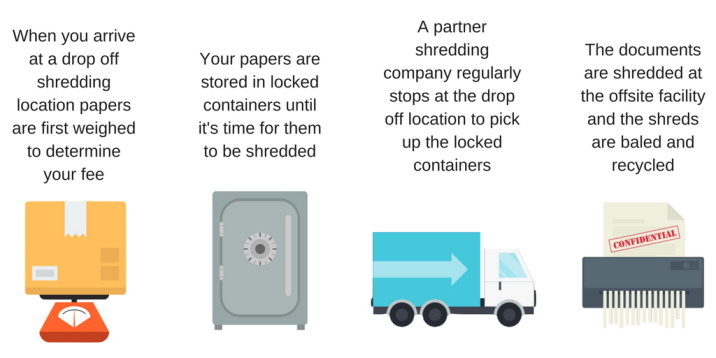 If you don’t expect to have 100 pounds of paper anytime soon, skipping scheduling and dropping off documents at a nearby drop off shredding location is likely the cheaper strategy. Drop off (walk-in) is ideal for shredding projects under 100 lbs. Usually drop off shredding locations can take up to three bankers boxes worth of paper and charge by the pound. Mobile shredding is geared for larger shredding projects. Mobile is a flat cost for service no matter the paper quantity, and can typically handle 100-300 lbs. On average, drop off shredding locations charge $1 per pound. It’s recommended that you drop off anything up to 100 lbs to get the most for your money. After that, the shredding price will continue to increase with quantity when dropping off, while mobile shredding costs will stay the same. 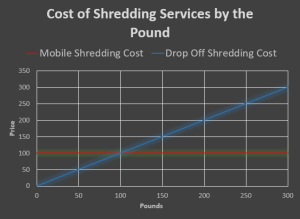 Mobile shredding typically costs around $100. 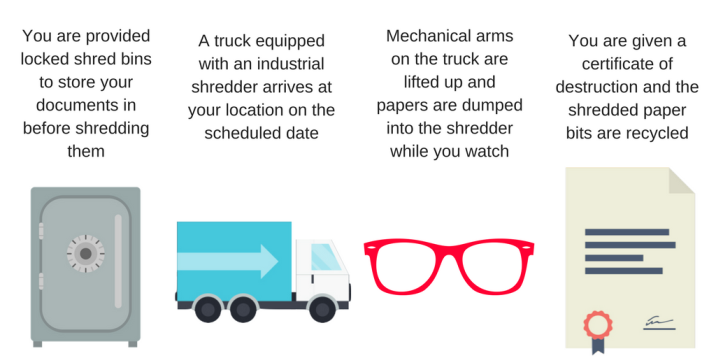 Once you have 100 lbs of paper or more, mobile shredding becomes most cost-effective. Mobile shredding can handle up to 300 lbs of paper for the flat $100 price, which compared to a $300 dollar drop off project makes a mobile service a much better deal for larger volumes. At a certain point, the costs for drop off and mobile shredding interest, and this is where your paper weight comes in. When you have little to shred, drop off shredding can save $75+ compared to mobile, but once your paper weight crosses the 100 lb point then it’s time to consider a new tactic. This crossroads is where the scaling price of drop off to match paper weight becomes a disadvantage. As the size of your shredding project grows, savings can grow as large as $200 per job. If you’re constantly needing to shred, saving your paper for the max 300 lbs may be something to keep in mind to get the most for your money. Figured Out Which Shredding Service is the Best Bang for Your Buck? Have you decided on the best solution for your project? Find nearby drop off shredding locations with our store locator, fill out the form on the right for free quotes on mobile shredding services in your area, or give us a call at (800) 747-3365. We partner with trusted document destruction providers across the nation, and work hard to help you find the right solution for your shredding needs. Shred on!